This 3rd edition of Sign Language Interpreting has been revised to introduce sign language interpreters around the world to essential professional knowledge and contemporary best practice in the field. 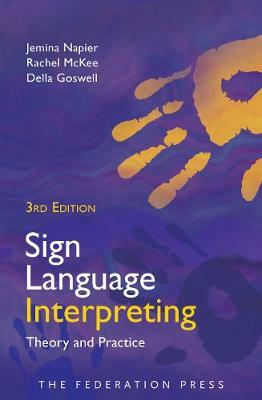 The authors' expertise as sign language interpreter educators, practitioners, ... read full description below. This 3rd edition of Sign Language Interpreting has been revised to introduce sign language interpreters around the world to essential professional knowledge and contemporary best practice in the field. The authors' expertise as sign language interpreter educators, practitioners, and researchers ensures this book integrates a deep knowledge of practical skills and models for sign language interpreting across a wide range of contexts and locations. This new edition provides an updated overview of the profession, introducing contemporary theoretical and applied aspects of interpreting practice. Drawing on international sources, it discusses the interpreting process, the role of the interpreter, professionalism and ethics, as well as challenges and strategies for working in particular settings, and using specialist interpreting skills. Each chapter includes thought questions that guide readers to reflect on the information and issues presented. This book is a valuable resource for sign language and interpreting students, interpreters entering the profession, as well as an international reference book for sign language interpreter practitioners, trainers and researchers.